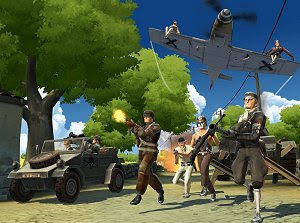 Battlefield Heroes is a great spin-off from the popular Battlefield series, using colorful cartoon graphics instead of a realistic setting and opting for a third-person view. The humorous tone, simple controls and addictive gameplay made it one of the most played free shooter games and one that provides days without end of fun combat on foot or using one of the several vehicles, from jeeps to tanks and airplanes. Battlefield Heroes is a game that just can’t be missed, with fast-paced but clever action. Those who prefer a more realistic approach should try Battlefield Play4Free, another free-to-play game from Electronic Arts.